Two relatively recent technologies that are constantly cited as the new must-have business tools are AI and Blockchain. While radically different, they, along with the Cloud, are commonly lumped together as the so-called “Digital ABCs” which will revolutionise how transactions take place between companies, clients, and customers. But their frequent pairing as drivers of progress is misleading. Blockchain and AI are about as similar as the storming the Bastille and the siege of Troy – in other words, only to a limited degree. 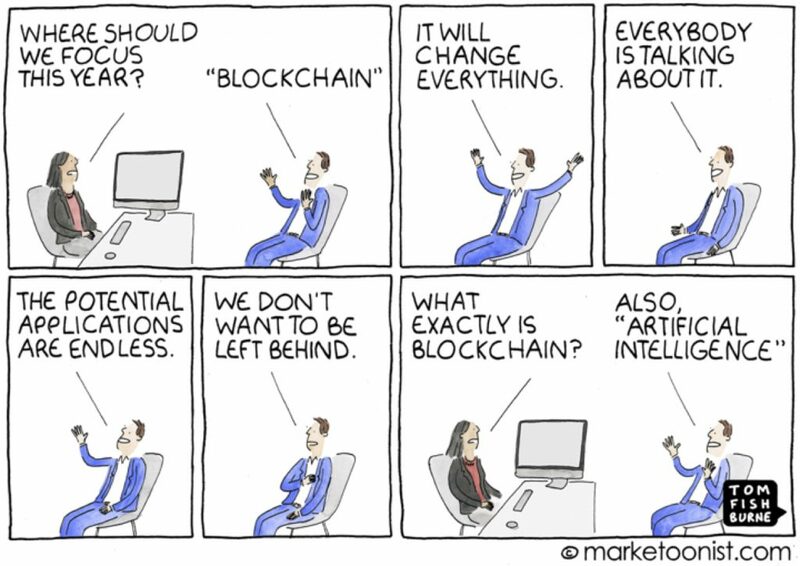 Undeniably, they both help businesses accomplish transformational objectives, but where blockchain tears down the barricades, AI slips in with minimal disruption. Blockchain has been touted as the technology that will “change everything” and it just might. The key with blockchain (and its biggest benefit) is that it seeks to “transform” long established business practices. This also creates its biggest problem. It batters headlong against monopolies held by financial institutions and the humans that staff them — who will not go down without a fight. Part of the problem is excessive hype. Just as “Kleenex” is the catch-all term for facial tissue, “blockchain” is now the stand-in for the more accurate term Distributed Ledger Technology (DLT) and its many individual iterations. What overexposure tends to do is conflate the documented failure of an individual product as a wholesale failure for all blockchain and DLT solutions. The other part of the problem, is that many intelligent people have vastly underestimated the magnitude of the challenge and the technical hurdles that are still to be jumped. Given these problems, and despite its authentic potential, blockchain is struggling to avoid descent into Gartner’s “Trough of Disillusionment” (see below). Easy wins for the technology have been far and few between, and progress has come much more slowly than promised causing widespread disillusionment. The revolution was supposed to be over by now but the siege continues. 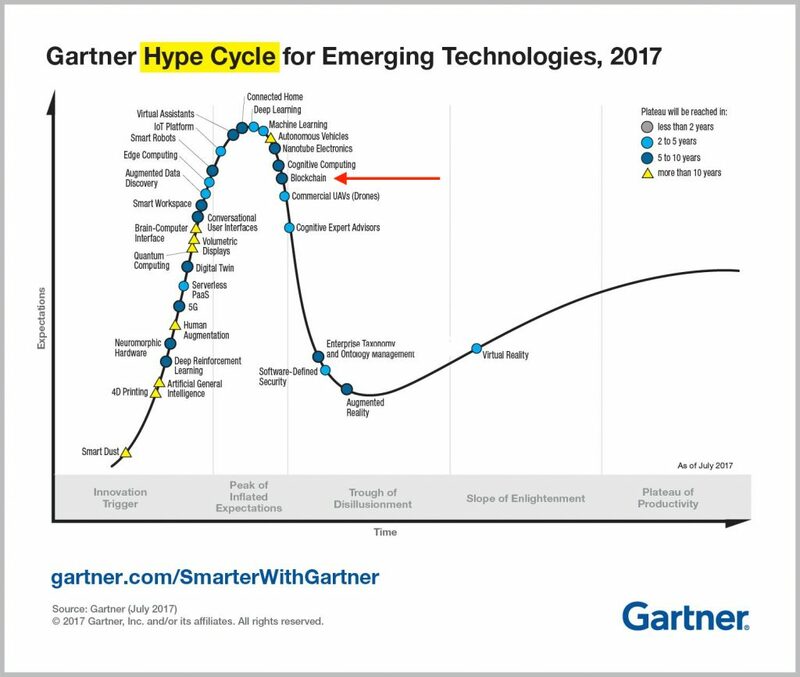 The grey fields on the X axis of Gartner’s Hype Cycle are: Innovation Trigger, Peak of Inflated Expectations, Trough of Disillusionment, Shape of Enlightenment, Plateau of Productivity. Note blockchain’s position approaching the trough. AI is being similarly touted as a transformational technology. Many ask whether its trajectory will likewise be similar to blockchain’s. The answer lies in the fact that the two are inherently, fundamentally different. While blockchain is at its core a technology that seeks to transform, AI is content to merely assist in conjunction with existing systems. AI does not need to overthrow the system in order to succeed. In fact, AI’s defining trait is that it can help humans do more, by helping them perceive our world from a different perspective. This is essentially rewiring human capabilities rather than the system’s. The effects are subtle, yet profound. All AI needs is a toehold to anchor and elevate the user’s opinion of its capabilites. It doesn’t need to transform your systems or how you do business. Just a presence, so that someone says, “hey that helped.” This doesn’t mean that AI won’t be transformational, it certainly will. It’s just that AI has a “Trojan Horse” like ability to slip into an organization and then slowly but surely make gains from within. The morning after the Bastille fell, the King asked the now famous question to a Duke, “Is this a revolt?” To which the Duke replied, “No sir, it’s a revolution!” With blockchain, “liberté, égalité, fraternité” may eventually result, but expect to see some flames as well. The defining characteristic of AI is that you can stick it on any existing process and slowly it adapts, learns, and is increasingly helpful. Take the first generation of AI driven chatbots as an example. They sit quietly on the sidelines answering FAQs. They are not transforming the process so much as trying to make the existing one better. It will take the second generation of these chatbots to start making a real dent in how we provide customer service, but rest assured that it’s coming, and with it a transformation. The cartoon that inspired this article. To put this all in context, let’s look at the recent and disappointing results of Swift’s “landmark” DLT proof of concept. Blockchain (DLT) failed here for two primary reasons. First, the technology failed to perform. The type of DLT used was unable to efficiently generate private accounts. This is an architectural problem for Hyperledger – of a kind that also plagued the Monetary Authority of Singapore’s (MAS) “Project Ubin.” Second, the POC failed because it couldn’t solve operational issues on the part of the banks using the system. Critically, this is a problem that is hardwired into blockchain. Humans have to change what they do in order to use the technology. This touches on a core tenet of innovation philosophy that holds that “technology is about focusing on people not the tech.” Did this blockchain POC really fail, or did it fall victim to humans demanding that new technology follow outdated processes? 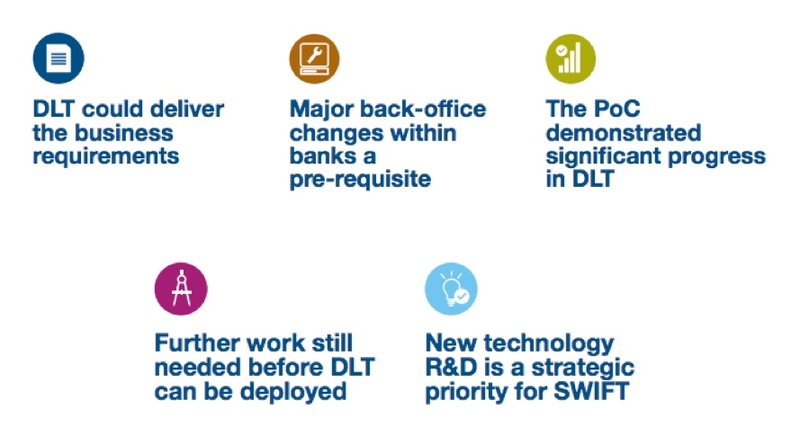 Either way, Swift’s upbeat report on the DLT POC declaring a victory, then shutting the project down, makes one wonder if Swift and the banks breathed a collective sigh of relief that they were able to postpone the revolution. 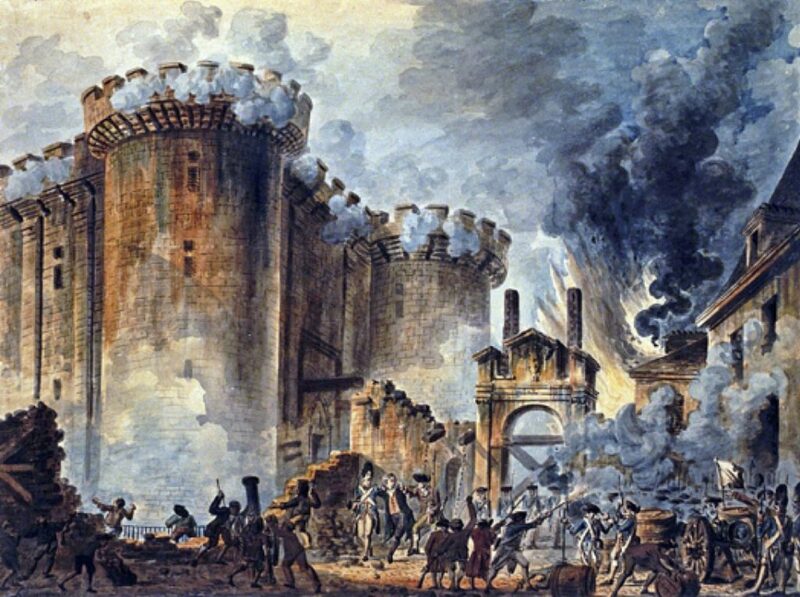 One thing we can say about the storming of the Bastille is that it changed France, and was a defining moment for subsequent revolutions of the 1700’s. I don’t doubt that Blockchain (DLT) will have similar cultural reach, it’s just that we’re asking a lot of this new tech and more importantly even more from the humans whose work it seeks to displace. 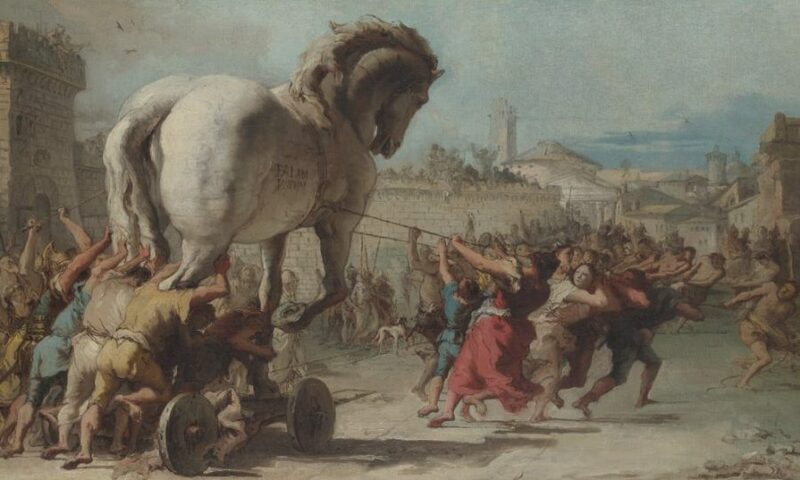 The Trojan Horse was used not to start a revolution, rather it was a new tool and a stealthy one at that. The fact that it remains famous thousand of years later says something for its power. AI takes much the same approach. It will be tremendously useful, and increasingly capable, until one day it simply transforms your business from within. That’s why the development of AI is a different modality from blockchain, and anyone betting against AI is, like the Trojans, in for a big surprise. 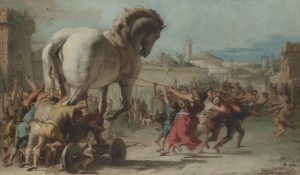 This is part of a series of sketches illustrating a famous passage from Virgil’s Aeneid: the Trojans, who worship the horse, bring the Greek gift into the city. Later the Greek soldiers emerge from it and begin the sack of Troy. AI can ease into your organization without tearing down the walls, the way blockchain tends to do.